FMs Radnai and Scharrer Patrick(ITA) shared first with 6/7. White had the more dangerous passed pawns on the queenside and the easy plan of Kf2-e3. White continued 35.Kf2 Ke5 36.Ke3 and won in a few moves after Black dropped the e-pawn. I contributed a rather sad loss as my teammates won game after game. Black has some piece pressure against White’s pawn center but the d6 pawn is suspiciously weak. Here I wanted to complete development with my worst pieces being Qd8/Ra8 which were doing nothing while the d6 pawn was backward and under attack. I continued 19..Qb6 guarding the d-pawn and attacking b2 with the idea of ..Rad8 and some semblance of development. Much better was 19..Bxf5! removing the active knight and opening the e-file. After 20.ef Nh4! (analysis diagram) Black is winning as the queen has nowhere to go. (B)21.Qf2 Ng4! 22.Qe1 Nxg2! (diagram) The knights take over. Now 23.Kxg2 Ne3+ forks off Bc2 and Black wins. White has the simple 28.Qg4 hitting the undefended Nh4 and escaping the pin to remain up piece. Black wriggled around but had to resign after 53 moves. MTK won both its matches. I had the day off so not much else to report until pics and PGNs get done and sent to me. 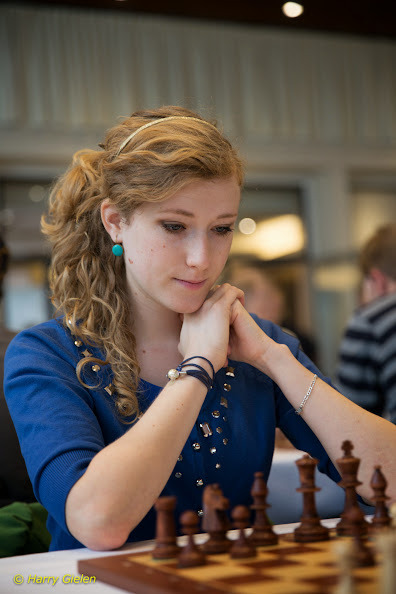 FM Csonka Balazs beat GM Grover Sahaj(2491) and finished with 8.5/13. Varga,K also won, beating Munoz Claudia(USA-1906) to finish with 7/13. Board 1 of R13-The ceremonial opening move. Photo official site. 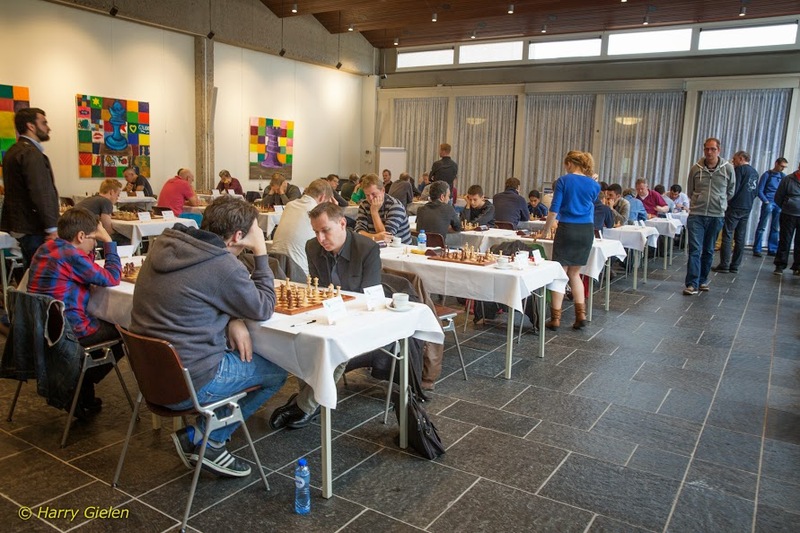 WGM Rudolf,A(HUN) lost to GM Kasparov,S and finished with 5/9. Another candidate GM. Photo by Ab Scheel from Official gallery. FM Csonka Balazs beat Shailesh Dravid(2074) and now has 7.5/12. Playing hall-Girls tournament. Photo from official site. Csonka Balazs lost to IM Karthikeyan Murali(2499) and remains at 6.5/11. GM Wei Yi is in clear first with 9/11. WGM Rudolf,Anna(HUN), Photo from Gielen,H gallery from official site.